25 years ago, Cass plead guilty to the murder of his girlfriend, Dita. Now, he is almost finished serving his prison sentance. His identical twin brother, Paul, has meanwhile climbed the political ladder and is now a state senator running for mayor. Dita’s brother, Hal, has never been quite convinced that Paul was not involved in the murder. Hal is now a sucessful real estate tycoon, who retains the services of Evon, a former FBI agent. He directs her to research Dita’s murder with the help of Tim, a very old private investigator who was on the case 25 years ago. 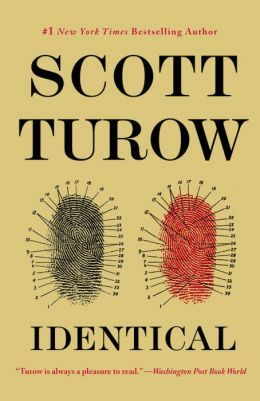 In Identical Turow brings the courtroom drama for which his novels are famous. He includes complicated details about doing DNA and fingerprint analysis on identical twins. He switches back and for from the present drama between Cass, Paul and Hal- and what happened 25 years ago. He writes a nice backstory for Evon, including her complicated relationship with her current girlfriend. Turow writes all of those things well, but he is most famous for (and I like him best for) his plot twists. Identical certainly has plot twists! I feel like there were 3 major ones in this novel; I did guess one (primarily because I was looking for it) but was happily blindsided by the other 2. I will say just this- its not an accident that the characters in Identical are Greek, and their names allude to more than one myth. This entry was posted in Fiction and tagged book review, DNA, family, legal, lesbian, mystery, secrets, twins. Bookmark the permalink.